As February rolls around, two subjects start winding their way into normal society’s consciousness. Love and chocolate. Here at Dead Sled we found a way to take the mushiness of love, and combine the love of chocolate with coffee. 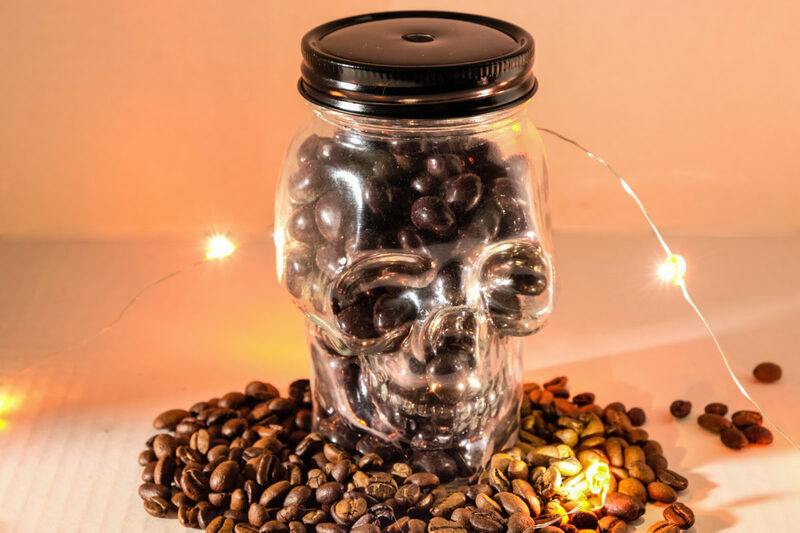 Check out our new chocolate covered espresso beans contained in a skull glass. While Valentines day may be a made up holiday, the effects of our chocolate covered espresso beans can be backed by scientific fact. Imagine that you have just received our delightful skull from your loved one. You open the lid and the smell of coffee and chocolate fills the air. You gently pick up one of the delicious beans and pop it into your mouth. Then what happens? Tryptophan and serotonin: They create feelings of relaxation and well-being. Caffeine: This psychoactive substance creates temporary alertness. Xanthines: This mild stimulant occurs naturally in the brain and, like caffeine, increases wakefulness. Theobromine: This stimulant and vasodilator increases blood flow. Phenylethylamine: This compound stimulates the brain to release dopamine, a neurotransmitter associated with feelings of pleasure and motivation. Anandamide: This neurotransmitter activates pleasure receptors in the brain. Flavonols: Found also in foods like red wine, blueberries and green tea, these compounds boost blood flow to key areas of the brain for two to three hours after being metabolized, creating effects similar to those of a mild analgesic (painkiller) like aspirin. As a result, you will be hooked on our chocolate covered espresso beans. You’ll also be left with a cool skull glass suitable for your favorite Dead Sled beverage. This entry was posted in Dead Sled Coffee Blog and tagged chocolate, espresso.